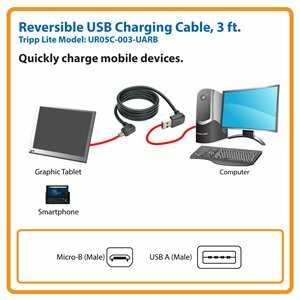 Tripp Lite's UR05C-003-UARB is a 0.91 m (3-ft.) Micro USB cable dedicated to charging mobile devices such as tablets and phones. Constructed of 20AWG power lines, it ensures the fastest charging of your device. It also features an Up / Down Angle Reversible A connector, which takes the guesswork out of which way to position the A connector for plugging. The Up / Down Angle A connector and corresponding Right Angle Micro-B connector are ideal in situations where space is at a premium, and reduces stress and excessive bending on the cable. Tripp Lite’s Reversible USB Charging Cable is dedicated to charging your mobile devices. Use your computer’s USB port or a USB wall charger to charge mobile devices that have a USB Micro-B port, such as tablets and smartphones. This 3 ft. cable has 20 AWG power lines for fast charging (it does not transfer data). Unlike traditional USB cables that can be attached only one way, the UR05C-003-UARB has a reversible Type-A (male) connector that plugs into a USB port in either direction. This takes the guesswork out of USB connections and makes installation easier and faster. Both connectors are angled to make installations easy in hard-to-reach areas. The angled connectors take up less space and reduce strain on the cable. The UR05C-003-UARB is constructed of top-quality materials. For optimal connectivity, this reversible cable has nickel-plated connectors with gold-plated copper contacts. The cable’s molded connectors with strain relief guarantee durability and long life. A flexible PVC jacket makes the UR05C-003-UARB easy to install in tight spaces. For peace of mind, the UR05C-003-UARB comes with a lifetime warranty. It’s manufactured in compliance with strict RoHS specifications, reflecting Tripp Lite’s commitment to environmental responsibility.